This week, Your News to Know rounds up the top stories involving gold and the overall economy. 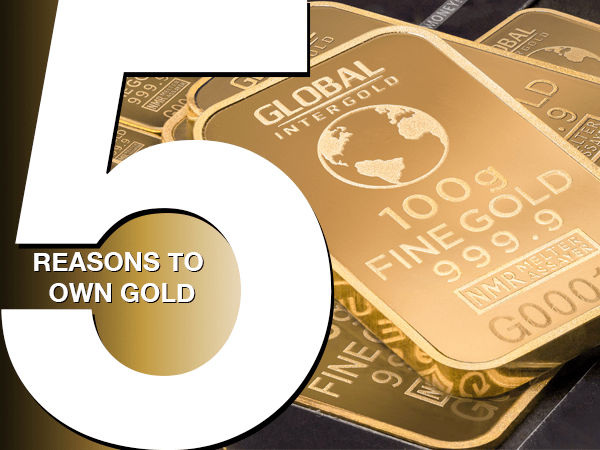 Stories include: Five reasons why you need to own gold, why gold could keep rising, and new app will let Indians buy and sell gold on their smartphones. #1: Real interest rates remain negative. While there has been much talk about the Fed raising nominal interest rates, Garret and McBride remind us that real interest rates are what really matters to your savings. With real rates remaining in negative territory, storing your capital in cash in a bank, purchasing U.S. Treasuries or dividend-paying stocks will result in your purchasing power eroding. The authors say that gold, however, is one asset that will not only allow you to preserve your capital, but also grow it. #2: The dollar’s value is collapsing. The U.S. dollar might be continuing its rise against other currencies, but the greenback’s purchasing power has still fallen 86% in the last 50 years. Garret and McBride argue that this makes wealth preservation through cash an unsound strategy. The price of gold, on the other hand, has increased by 2,400% since owning the metal was legalized in 1972. #3: Gold is money. The Greek philosopher Aristotle said that any form of money must be durable, portable, divisible, and have intrinsic value. Garret and McBride point out that gold has all of these qualities, which is why it has been able to retain its value while fiat currencies have fallen. #4: Gold has a negative correlation to stocks and bonds. Because of gold’s negative correlation against both assets, buying the yellow metal is one of the best ways to diversify your savings, especially considering that the correlation between stocks and bonds has almost doubled in the last decade. #5: Gold has no counterparty risk. Unlike most other investments (currencies included), owning gold doesn’t make you dependent on anyone’s promise to fulfill a payment. Garret and McBride round up these reasons by noting that gold is much more than just a capital preservation tool, as evidenced by its recent gains. Since the beginning of 2017, the metal gained more than 10% and has outperformed the S&P 500 by 30% since late 2015, further establishing its status as one of the best-performing asset classes in the past couple of years. A recent Barron’s entry examines why gold is bound to keep rising in the current economic and geopolitical landscape, noting that its rise of over 10% since the start of 2017 reflects concerns over a slowdown in the U.S. economy as well as the rise of populist candidates in various parts of Europe. In addition to weaker-than-expected U.S. employment data for March, the article notes that consumer prices in March posted their first monthly decline since January 2010. It’s yet another sign that the U.S. economy could be slowing down. Weaker growth could put a dent in the Federal Reserve’s plans to hike rates at a faster pace this year, which would be a plus for gold. Further, the article says that the failure of the GOP to repeal the Affordable Care Act last month sparked concerns over President Trump’s pledges to cut taxes and boost infrastructure spending; analysts at Standard Bank said in a recent note that further signs of Trump’s legislative agenda not going as planned could send gold above $1,300. Finally, the French presidential election is keeping investors on their toes, as far-right candidate Marine Le Pen has promised that if she were to win, she would withdraw France from the eurozone. Coming less than a year after the Brexit vote and the election of Donald Trump, a political outsider, this has some investors concerned. And France isn’t the only nation in Europe that has been a cause for some to be concerned; votes in surrounding countries later this year promise to continue to keep the region embroiled in uncertainty. Last week, India’s top digital payments platform, Paytm, announced that it will allow users to purchase gold through its mobile app. The physical gold will be supplied by a refinery called MMTC-PAMP, a joint venture between the Indian government and a Swiss bullion company which will also provide the vaults for bullion storage. Users will be able to have the gold delivered to their homes, as well as use the app to sell gold they own. The news should come as no surprise considering India’s appreciation of gold – the country has imported gold worth $4 billion in the last month alone, and Paytm estimates that the country’s 1.3 billion people currently hold 24,000 tons of gold worth $900 billion. “Gold is probably India’s truest wealth management product,” said Paytm CEO Vijay Shekhar Sharma, whose company was a major beneficiary of the Indian government’s decision to ban most of the cash in late 2016.